Had a great day at the Bundaberg Show 2012 with my two beautiful double-dilute girls. With really cold, windy and wet weather and trying to keep two white horses free of red mud was nearly impossible. Washing their legs every day for nearly a week and keeping many rugs on them to keep them dry, paid off in the end. 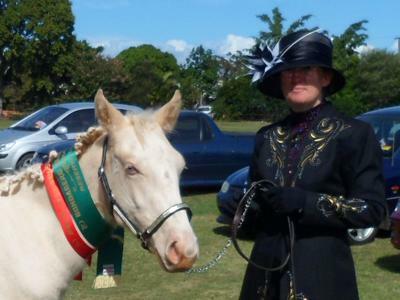 Both horses, mother and daughter took out their class- Any Other Registered Pony Breed Mare/Filly. Vanora-Fehr The Precious winning first place and her filly Vanora-Fehr M'Zel taking out second place. 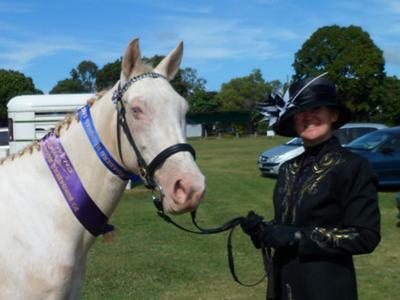 V-F The Precious won the Champion ribbon and V-F M'Zel won the Reserve Champion ribbon in the same class. A fantastic effort considering it was M'Zel's very first show. Thrown into the deep end with no actual practice shows. I am very proud of my two dilutes. It was a wonderful day out. Congratulations! I find a couple of socks hard enough to keep white. I now have my first palomino dun & have to keep a mane & tail white! It's always a huge buzz when you take your young ones out for the first time & they behave like they've been doing it for years!